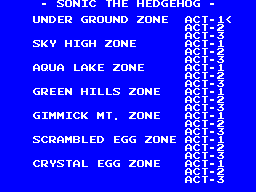 Sonic The Hedgehog 2 - Cheats - SMS Power! As the game starts, before the screen turns dark blue, hold + + on controller 2. Release them after it turns blue (and the intro animation starts). Start the game with controller 1 to display the level select menu.